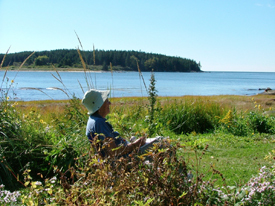 Artists have long been inspired by the natural beauty of Maine, and the midcoast has a particularly long and strong tradition of place-inspired artmaking. The Georges River Land Trust and K2 Family Foundation are pleased to announce a new partnership to offer an artist-in-residence program to begin in summer 2013. The artist-in-residence program offers professional visual artists, performing artists, and writers the opportunity to pursue their artistic disciplines while being inspired by the Georges River watershed’s extraordinary landscapes. The information sheet provides additional details and instructions for applying. The artist will have access to many of the Land Trust holdings as a resource for creating new site-inspired or site-specific work. Artists will receive a stipend of $10,000 (paid over the duration of the residency) and may be eligible for additional production support relevant to their project. Artists are asked to make themselves available to the public during their residency in a variety of ways. Depending upon the artist’s medium, such visitor contact might include a guided walk, workshop, hands-on participation in a project, etc. Formal public presentations will consolidate the artist’s relation to the community and celebrate the efforts being undertaken by both the artist and the Land Trust. Documentation of the project will memorialize the artist’s experience. The application period for the artist-in-residence program runs from November 1, 2012 to January 1, 2013. Additional information on the program and an application are available at the K2 Family Foundation website.